Nature-Based Solutions (NBS) are multi-functional solutions inspired by nature that draw on natural forces and resources. They exploit natural capital with two or more ecosystem services. An NBS can be a natural area or an application with natural elements. One of the ecosystem services involved will always be biodiversity to a certain extent: a wetland provides a high biodiversity, however, a grassy parking lot also provides a certain level of biodiversity. Examples of solutions of this kind are: green walls to enhance the living environment, forests to reverse or stop deforestation, wetlands for water treatment, urban parks for leisure activities, dunes for flood risk management, lakes for water storage, urban trees to purify air and so on. How do Nature-Based Solutions contribute to a green economy? Last week I was in Tallinn (Estonia), where there was a wonderful conference on NBS with about 400 participants. Estonia is the current EU president and it organised this flagship event (www.nbs2017.eu). It was clear to see how the NBS community is evolving or how, at least, the discussion about NBS is evolving. Only three years ago, an event like this was dominated by debates about the definition of NBS. However, the discussion has now moved on to more advanced areas: How do NBS contribute to a green economy? How do eco-innovation, the circular economy and NBS interact and strengthen each other? How should we implement NBS to attain a ‘common use’ level? I am very confident that the NBS approach will mature in the years to come and become an approach that is widely accepted. Please accept cookies to watch this video. The use of existing natural areas as NBS, where we can use one or more ecosystem services in addition to the conservation or promotion of biodiversity. New NBS designed and installed to support one or more ecosystem services and to make a given contribution to biodiversity. It is important to realise that these two categories exist because the first focuses on ecosystem restoration or ecosystem adjustments with the aim of using ecosystem services; it starts with the ecosystems in place. The second category focuses on design and involves a relatively high level of discretion about the prioritisation of benefits because, up to a certain extent, it can be used to design any type of ecosystem. In this blog, I will be focusing on the second category: new solutions designed and installed to provide specific benefits. This category can be subdivided into two groups that require different implementation strategies at the operational level. Please note that I have focused on urban areas and I have my reservations about whether all that I have to say will apply equally to rural and coastal areas. Hybrid NBS: combinations of hard infrastructure with soft or green elements, examples being green walls, green roofs, mobile plant containers, and so on. They often focus on one or two benefits in addition to the contribution they make to biodiversity. Effectively, they cannot exist without the hard structure. They are not connected to the subsurface and therefore not dependent on the nutrient fluxes or hydrological flows in the local system. As a result, their potential for replication high. Ecosystem-based NBS: re-installations of ecosystems or parts of ecosystems, examples being urban parks, natural embankments, urban wetlands, and so on. They are connected to the subsurface and are therefore highly dependent on local hydrological flows and nutrient fluxes. This consideration, and the fact that we expect them to deliver numerous ecosystem services, makes the implementation of these solutions complex. It is perhaps no coincidence that many start-ups work on hybrid NBS because the ‘product’ is highly replicable. However, the most successful start-ups working with hybrid NBS focus on one or two benefits, and quantify and visualise those benefits: how much air is purified, how much water is filtrated, or how much carbon is captured? In other words, the NBS owner or stakeholder knows what he/she is getting for his/her money. How can we achieve a similar situation for ecosystem-based NBS? Let me give you an example of a highly complex ecosystem-based NBS: the Marker Wadden in the Marken lake in the Netherlands. There are major problems in this lake with the turbidity of the water and the ambition of the stakeholders in the project is to enhance both the diversity and the size of the bird population (MarkerWadden). An archipelago has been designed and it is being built as we speak. It is already serving as a new habitat for birds, and it will reduce the levels of sediment suspended in the water and improve the clarity of the water locally. Stakeholders have been invited to the table to discuss their wishes for other ecosystem services. However, this step makes the process highly complex and lengthy discussions would appear to be inevitable. Let us take a step back and consider why the Marker Wadden was set up originally and what the bulk of the implementation budget was originally earmarked for. 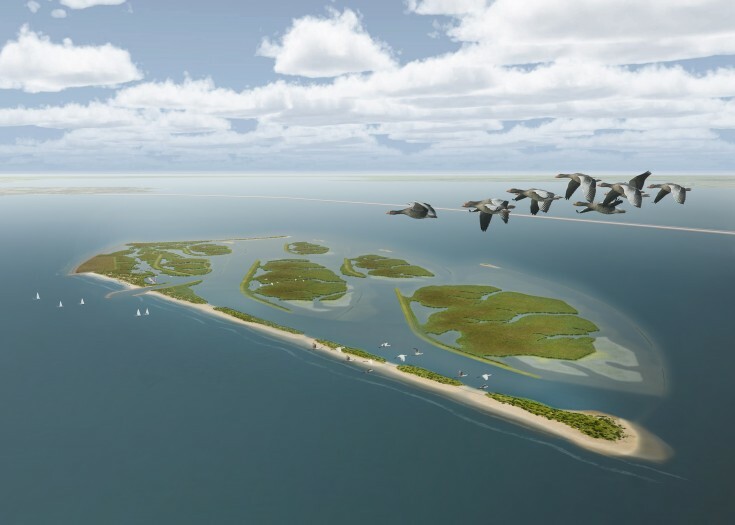 Rijkswaterstaat (the Dutch Directorate General for Public Works and Water Management) wanted to improve water quality and the Dutch conservation organisation Natuurmonumenten wanted to enhance biodiversity. These two ecosystem services (ESS) are the leading ESS; they need to be maximised and given priority over all other ESS. The other ESS (leisure, biomass production, production of bio-based materials, knowledge development, and so on) are the secondary ESS; they should be optimised but not have any negative impact on the leading ESS. In the course of time, any increase in the significance or success of a secondary ESS may result in that ESS becoming a leading ESS, with all the associated privileges. In terms of knowledge development this means that the synergy and trade-offs between the secondary ESS and the leading ESS need to be assessed beforehand. Adopting this line of thinking and defining the leading ESS and potential secondary ESS, together with their synergies and trade-offs, brings back simplicity to the implementation process of ecosystem-based NBS. Quantifying the leading ESS and explaining the results to the NBS owner and/or stakeholders opens up the road to ‘common use’. Defining and quantifying the leading ESS, as well as the deployment of the appropriate budgets to make implementation possible, implies that implementation (and initial installation) can begin without broader stakeholder involvement processes. Indeed, it is important to remember that almost all ‘new NBS’ initiatives start in a small group of stakeholders who set up a potential business case and acquire financing, while secondary ESS (with broader stakeholder involvement) are added later in the operational implementation process. Please accept cookies to comment on this article.